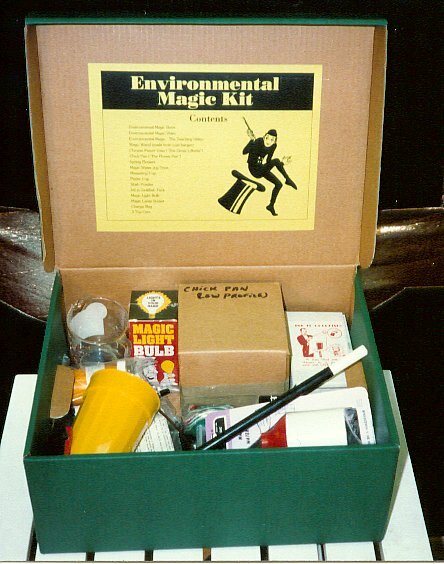 It started way back in 1994, when a young magician named Chris Walden realized that MAGIC could be used to help teach issues related to the environment. Chris pitched the idea to the Texas Resource Conservation Commission (TNRCC, now the Texas Commission on Environmental Quality, or TCEQ), and they worked together to obtain a grant from the Environmental Protection Agency (EPA) to fund the creation of the Environmental Magic Kit, a tool for trainers. Chris brought in Kent Cummins, a magician who had an established business structure as Magic Hotline, and the two of them worked together to produce and promote the kit. Chris and Kent took a TNRCC brochure which explained six specific environmental issues, and created a magical application for each issue. There were two tricks for helping with air quality, two for water quality, and two for waste management. 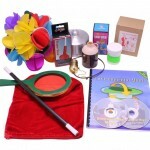 The tricks were obtained from magic dealers, and a book and two videos were produced using local resources. One video, the Performance Video, showed a town hall meeting in which individual members each performed one of the six tricks. Chris became the Environmental Mime as a silent Master of Ceremonies, tieing the tricks together into a coherent presentation. The presenters were a particularly diverse group, but all were actually members of the International Brotherhood of Magicians. The Performance Video, which ran under 15 minutes, was designed to be shown to the public when resources were not available to provide an actual trainer. Magic Hotline also created a Teaching Video, about 45 minutes showing how to perform each of the environmental magic effects. This video was NOT intended to be shown to the public. In fact, an Oath of Secrecy was provided as the first page of the Environmental Magic Book! 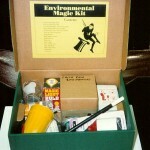 The Environmental Magic Kit was a huge hit in Texas, and became popular throughout the country as trainers from Texas talked about the kit with peers at national and regional conferences. The EPA designated the kit as a “Recognized Project,” and letters of appreciation came in from around the country. 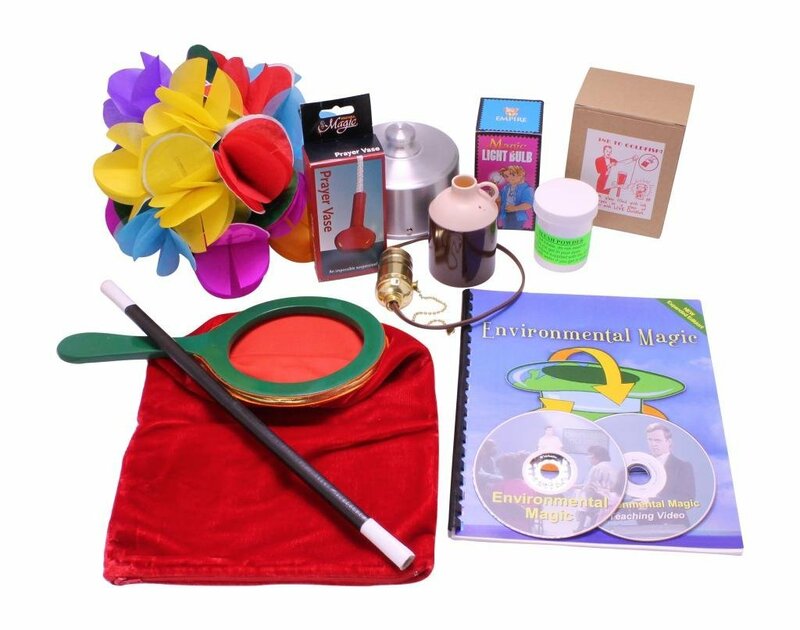 Eventually, the kit had to be revived with DVDs instead of VHS tapes, and the Environmental Magic Book was rewritten and updated to provide new information and Internet resources that did not exist when the kit was originally created. Chris Walden is a curious guy who has explored many different aspects of theatre, media, and technology. He has spent 20+ years as a performing magician for private and commercial events. He is also involved in other aspects of the theatre both on and behind the stage as an actor, director, writer, stage manager and technical director. Chris’s experience as a teacher and presenter for IBM has taken him all over the world. He combines all of his diverse interests and unique skills to bring a multi-faceted approach to communicating and entertaining.